You’ve probably heard of the often quoted statistic that 80% of women are wearing the wrong bra. Whether this statistic is true or not remains to be seen. But, one thing is for sure – a poor bra fit is not good for you. stubborn bulges that make your figure go out of shape. The longer we ignore these problems, the harder they become to treat. Here are 7 signs of a poor bra fit and tips on what you can do about them. Bra straps that dig into your shoulders are not just a painful nuisance. They can lead to deep grooves in the shoulder, headaches, and even nerve problems. This makes your straps do all the work and adds strain to your shoulders. Many women forget that the band gives 80% of the support needed, and choose to tighten the straps to lift the bust – adding more strain instead. Thin straps are not for everyone – especially if your breasts are larger and heavier. What can I do about digging straps? Your bra band should fit snugly and create a straight line across your back. Adjust your strap – Support should come from bra band and not by tightening your straps. If you have larger, heavier breasts, consider a bra with thicker straps to protect your shoulders. This is one of those things that makes you want to resort to tape or safety pins. If you can fit more than two stacked fingers between your shoulder and the strap, then your strap is too loose. If your straps fit snugly, but you still find them slipping, chances are your band is too big for your body’s width. If you’ve ruled out the first two causes, then it is possible that you may have narrow or sloped shoulders. What can I do about slipping straps? You should only be able to fit two stacked fingers comfortably between your shoulder and the strap. Your band should fit snugly and create a straight line across your back. Get bras with narrower set straps and avoid balconette and plunge bras. That slow sensation of your bra band slowly creeping up your back can be a nasty feeling – especially when you’re in public. Your body doesn’t get the support (80%) it needs – making your breasts droop and the band climb up. Tightening the straps when the band isn’t snug worsens the creeping up and makes you droop even more. With time, every piece of fabric relaxes and loses elasticity. What can I do about creeping band? Use tighter hooks. If it doesn’t work, it’s time to replace your bra. This is when there’s a gap at the top of your bra cups, and the fabric at the top of the cups wrinkle and does not lie flat. If your straps are not properly tightened, the top may have a gap too. A gap at the top of the cup is often due to a cup size that is too large. Every woman’s body is different. Your bra may simply not be the right style or shape for your breasts. What can I do about baggy cups? Sometimes, that’s all you need to do. Consult a professional bra fitter to try something that is designed to flatter your unique shape. This is when a line appears across the chest, breaking up the smooth curves and making it look like the breasts are spilling out over the top. This is the most common reason. Many women have larger cup sizes than they think. Others may also mistakenly believe that getting a smaller cup is necessary to create a cleavage. Wearing a bra that does not mould to the shape of the breast also causes bulging issues. What can I do about cup overflow? 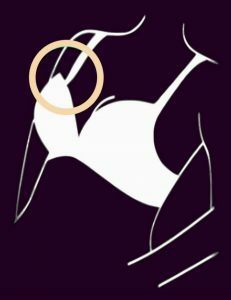 A bra that is fitting correctly should encircle and contain your breasts. 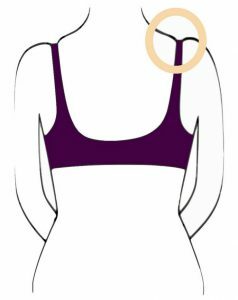 A snug band is necessary and the center underwires must lay flat against your chest (and not the breasts). Consult a professional bra fitter to find a bra that gives you proper support. 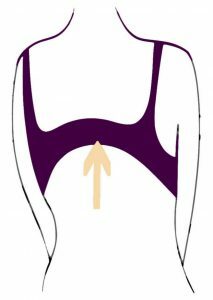 Here, a bump spills out from back of your bra to create an embarrassing bulge that shows even under your clothing. 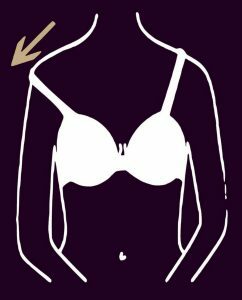 If your cup doesn’t let your breasts sit properly, they’re forced to shift to the sides and to the back. Your band may be forcing your body fat and breast tissues downwards because it is too tight. What can I do about back fat? Loosen the hooks if needed. A snug band pulls the wire back and allows your breast to sit into the cup properly. Try a bra with a wider band and a high-cut side for better fit and coverage. This is the most common reason. Many women have larger cup sizes than they think. If the band does not fit snugly, it can cause the wire to sit on your breast. What can I do about side overflow?